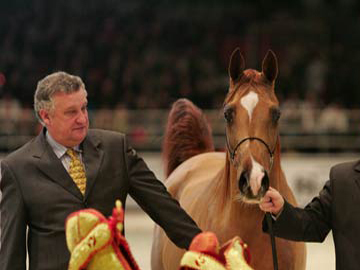 Both Senior Supreme Champion title winners originate from Poland, the 5-year-old Champion Mare EMANDORIA (Gazal el Shaqab x Emanda) and the 14-year-old Reserve EMBRA (Monogramm x Emilda). Both were bred by Michalow Stud and are from the famous 'E' dam line. 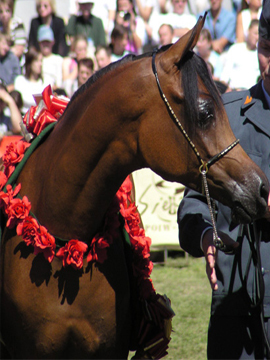 The two Junior Female titles went to Saudi Arabia, with LAYAN AL KHALEDIAH (by Dakharo), the 2007 World Champion Filly, in the lead. She won sovereign with 5 of votes from the six judges in the very top. LAYAN is proudly bred and owned by the famous Al Khalediah Stables of HRH Prince Khaled bin Sultan Al Saud. 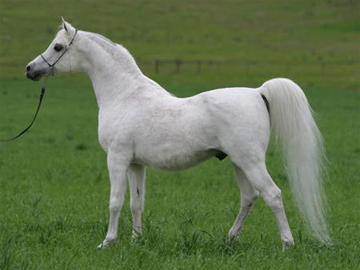 The reserve title went to the 2008 World Champion Filly, ABHA PALMA (by Marwan Al Shaqab), owned by the Al Mohamadia Stud of HH Prince Abdullah bin Fahad Al Saud. Also ABHA PALMA won her title souvereign being named 2nd in all judges' cards. In a strong and tight competition, LAYAN's sire DAKHARO, added his success to the Al Khalediah Stables' records, being 2009 Las Vegas Reserve Champion Stallion with three of the six votes for 1st. 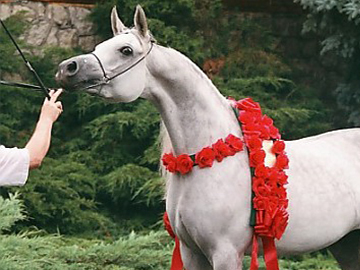 When she appeared at the Polish Nationals in 2004, and just being a yearling age, PIANISSIMA immediately won - not only the title, but also the heart of many people! Within the following month, she also won the three major title shows in Europe (All Nations Cup in Aachen, European Championships, World Championships), and became a so-named "Triple Crown Winner" in the junior age group. In 2008 , and just four years later, PIANISSIMA - returned from her lease in the U.S., she repeated her success in exactly the same way as years before being Polish National Champion Mare and "Triple Crown Winner" 2008, this time in the senior age group. KWESTURA sold for 1,125 Million Euro... Congratulation!!!!!!!!! The 2008 Pride of Poland auction provided a huge surprise and tremendous sensation by making available the 2007 World Champion, Scottsdale, and multiple International Champion Mare KWESTURA, a Monogramm daughter out of Kwesta! So everybody became focussed for the second weekend of August, when the Polish National Show and Auction is held each year. And indeed, this year's auction result became a special event, in total but especially so because of this mare. Three buyers, one from Europe, and two from the Middle East, were bidding against each other to acquire this outstanding and exquisite mare. And finally, the hammer felt down at 1,125 Million Euros - in favour of the happy and proud new owner HH Sheikh Ammar bin Humaid Al Nuaimi and his famous Ajman Stud in the UAE. 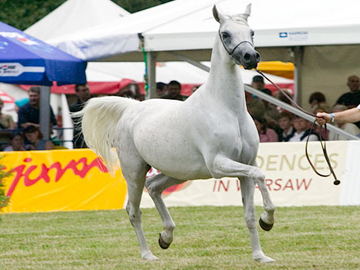 In addition, KWESTURA's son, the very typey and elegant two-year-old KABSZTAD (by Poganin) was judged to be the Polish National Champion Colt the day before, repeating his championship titles from the 2008 Bialka Spring Show in June . KWESTURA is in foal to QR MARC due February 2009 foal. Congratulations to HH Sheikh Ammar on adding this exquisite mare to his collection.